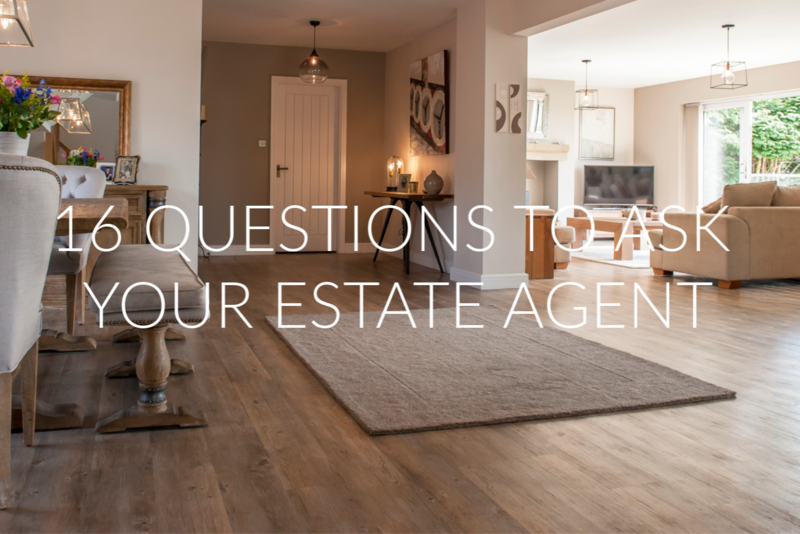 We think that in order to make an informed choice of estate agents, you need to be asking the right questions and carrying out some initial groundwork before selecting your short list. Estate Agents do not have the best of reputations for many reasons, but we believe one of the main reasons is trust. If the right questions are asked, you should feel that you can trust your agent to deliver on their promises. Most homeowners will invite 2 or 3 agents to their homes with little or no research beforehand. We believe that there is some work you should do before making a short list of agents to see. Both of which we feel are the wrong questions to ask. Our suggestions will give you a more detailed insight into the agents’ services and approach to selling your home, and hopefully help you to make the right decision from the outset. 1. ON AVERAGE, WHAT PERCENTAGE OF THE ORIGINAL ASKING PRICE DO YOU ACHIEVE? Why should I ask this question? Many agents will purposely over-value your property in order to win the instruction, especially at times when there are not many properties coming to market. If the agent is able to demonstrate impressive statistics regarding the final sale price, compared to the asking price, then they will A) have the statistics to hand and B) want to tell you about it. 2. WHAT IS YOUR AVERAGE TIME TO AGREE A SALE? If an estate agent cannot give you their average and replies with a vague answer then alarm bells should start ringing. The average time for a property to remain on the market in the North-West is 168 days. Any figure considerably longer than this should see you striking that agent off your list. 3. DO YOU USE A PROFESSIONAL PHOTOGRAPHER TO PHOTOGRAPH MY HOME? Most buyers will turn to the internet to search for their next home. It is therefore more important than ever that your home is presented in the best possible way so that it attracts the maximum amount of interest possible. All agents will agree that the most enquiries are generated from the online portals such as Rightmove and Zoopla, but very few actually invest in high quality photography which presents their client’s homes in the best possible light. Some agents will offer professional photography but will charge you separately for this, some will also tell you that the pictures are being taken professionally when actually it is a member of the team with a digital camera, who has been on a one day course and who is not actually a photographer. 4. DO YOU OFFER HOME STAGING AND STYLING ADVICE? Many home owners like an agent to give them advice as to what they need to do to their home in order for them to sell quickly and for the best price. Does the agent offer this advice, and can they demonstrate examples of where this has helped previous clients? Most agents will just agree that no improvements are needed in order for you to sign quickly and get the house on the market as quickly as possible. 5. DO YOU INCLUDE HOME STAGING AND STYLING ON THE PHOTOGRAPHY APPOINTMENT? As most people look online for their next home it is vitally important that your home looks its very best for the day of the photographs. Does the agent advise on what styling items you may need or even better bring them with them on the day? A gorgeous bunch of flowers for the fireplace or centre of the dining room table, some strategically placed candles and a couple of extra cushions and throws can really make you home stand out from the crowd. Many of our clients go on to purchase a few items to use for the viewings once we have advised them on how to style a room for maximum effect. 6. DO YOU PRODUCE A BESPOKE BROCHURE FOR MY HOME THAT IS ATTACHED ON RIGHTMOVE AND GIVEN OUT AT VIEWINGS? If the agent does the viewings, do they have brochures (not an A4 print out) to give to people? – many people will be viewing a number of properties, an individually designed and written brochure, professionally printed will be taken away, remembered and referred back to, making your home stand out from the crowd. Your home is your greatest asset and your brochure should be of the quality and calibre of the property it is portraying. It should be displayed in a way which matches those of the best hotels, high end boutiques, status watches and sports cars. There is a reason why Tiffany, Mercedes and The White Company all produce beautiful brochures – they work! 7. DO YOU TAKE ADVANTAGE OF THE PREMIUM PROMOTION PRODUCTS AVAILABLE FROM RIGHTMOVE AND ZOOPLA? Most homeowners don’t realise that estate agents have access to a number of products which can enhance your property promotion on the major portals such as Rightmove and Zoopla. They can potentially improve the visibility of your home and result in more interest. Very few agents invest in the premium products because it costs them more and ultimately means they don’t make as much money. 8. WHAT IS THE PLAN IF THE PROPERTY ISN’T SOLD WITHIN THE FIRST 4 WEEKS? This is an important question to ask. Most agents will ask you to sign a contract which ties you to them as a sole agent for about 3 months. However, statistics indicate that your home will receive only half as much interest after three or four weeks on the market, compared to weeks one or two. It is important that your agent has a longer-term marketing plan and will actively keep your home ‘fresh’ rather than allowing it to go stale on the market. 9. DO YOU ACCOMPANY ALL THE VIEWINGS? Many home owners are often willing to carry out their own viewings and sometimes would prefer to do it themselves as they feel they know their home better than anyone. Firstly, you are paying your estate agent to sell your home and you should not be expected to carry out a viewing, it is highly unprofessional for an agent to send a stranger to your home at all times of the day and night for you to try and sell your home to them. The estate agent is the trained professional and should know how to pitch a property to a viewer. An agent who does the viewings should have a pre-prepared viewing plan and viewing notes (details about your home) which have been completed by you. A potential buyer is more likely to be honest with the agent than you, the home owner, telling them what they like and what they don’t like about your home. If you carry out the viewings, they are likely to say what you want to hear leaving you disappointed when an offer does not materialise and becoming disillusioned with the whole process. Your estate agent will know what the viewer liked about your home from their initial enquiry, so can focus on that when first showing the buyer around. Home owners often either say too little or too much at the first viewing, The viewer will probably want to get that initial feeling of ‘can I see myself living here’ and they do not want to know every detail of the house, such as when the window cleaner comes or what bin to put out when. Equally some homeowners will send the viewer off to look around the house themselves and not engage at all with the buyer giving them the feeling that maybe that they are not motivated to sell. Your estate agent is the person who will be negotiating with the potential buyer and in our opinion needs to have met the applicant and conducted the viewing in order to be able to negotiate an offer and sale effectively. Your estate agent who is a trained professional will know that the viewer liked and disliked about the house and be able to use this at the crucial first stage of negotiation. For example, if the viewer remarked that all three bedrooms were bigger than anywhere else they had seen and offer £10,000 under the asking price, the agent can agree to forward the offer but remind them that the bedrooms are bigger than anywhere else that they have seen. A good agent will always want to meet potential buyers personally, this is a service of a good agent. 10. ARE YOU OPEN AND DO YOU ACCOMPANY VIEWINGS OUTSIDE OF BUSINESS HOURS AND AT WEEKENDS? Most buyers will want to view your home when they are not at work and for most people this is early evening or at weekends, if your agent is not able to accommodate these times you are likely to lose viewings and eventually sell at a reduced price. 11. WILL YOU ACTUALLY BE MY AGENT THROUGHOUT THE PROCESS AND DO YOU LIVE LOCALLY? Many larger estate agency chains have staffing structures which means that the person who comes to see you may well have little to do with the sale of your home after instruction. Some larger estate agencies will have someone is who is the ‘valuer’ and is paid to get your signed up, they may well be paid on commission for each property they get ‘on the books’. The agency may well then have a viewer role and a negotiator role and then someone who takes over once you have a sale. You may have chosen your agent on the basis of the person that you initially met – you like and trust them, they understand your home and the reasons you are looking to move on. The person that you ultimately have to work with might not be someone that you feel you can get on with or trust the sale of your home with. It is important that the person showing your home is someone that knows the local area well and can discuss schools, transport networks and the best place to catch a bite to eat. It is important that you understand the structure of the estate agent you choose and who you will be dealing with on a daily basis. Will the person taking the calls and enquiries actually visit your home before going on the market so that they can answer key important questions and ‘sell’ your home to its potential new buyer? We feel that this is really important when deciding on the best agent for you – Travel Agents are sent to look around hotels and resorts so they can then talk about them to potential clients and your home should be thought of in the same way. 12. WILL YOU ALSO ACT AS MY ‘BUYING AGENT’ TO HELP WITH MY NEXT PURCHASE? Your agent is the professional, they have the skills and knowledge in order to help you sell your home quickly and for the best price. They should also be using these skills and insider tips and tricks to help your secure your next property for the best possible price. Any agent you choose should be willing to negotiate on your behalf, after all they are the professional. There are many benefits to asking your agent to negotiate on your behalf, not least the potential significant cost savings. We think that every agent should offer this service to their home owners but very few do. 13. WHAT RATING DID YOU GET IN RIGHTMOVE’S ‘BEST AGENT GUIDE’? Rightmove have recently started to produce ‘The Best Agents Guide’, it covers both sales and lettings and includes all the agents who advertise on Rightmove. Rightmove mystery shops every agent over the phone, and uses their online adverts, which includes the quality of the photography and the time it takes to sell your property to score the agent and then issue the best agents with a with a bronze, silver or gold award where appropriate. Did your estate agent receive an award, if so which standard do they achieve, highly rated (bronze), excellent (silver) or exceptional (gold). Visit our ‘Rightmove’s ‘Best Estate Agent Guide’ Explained’ blog for more information. 14. HAVE YOU GOT YOUR LATEST CUSTOMER REVIEWS TO HAND? The agent you have invited to value your home should have with them their latest customer reviews from clients who have experienced their service. If the agent has a good set of reviews, they should be willing to share them with you. A good place to look for reviews is Google and Facebook. 15. DO YOU HAVE A SOCIAL MEDIA MARKETING PLAN? Social Media whether you love or loathe it is a part of everyday lives. We use it to gather information about services and we look for companies who are recommended. You should explore an agent’s online presence, if they are not on Facebook, Twitter and/or Instagram it may be an indication that they haven’t caught up with the modern world and should be avoided as it probably means many of their practices are outdated, not just their social media. Also look at what they post on their social media channels – this will give you a good feel for what they are likely to do to market and promote your home in the best possible way. A good agent will have a clear outlined plan for promoting your home on their social media channels, and will have a clear understanding of using these channels for marketing. Just having a Facebook page and posting any old content does not always mean it is being used effectively. 16. WHAT HAPPENS WHEN I HAVE A BUYER? DO I KEEP MY PERSONAL AGENT? DO I GET SENT TO A CENTRAL HEAD OFFICE FOR MY SALES PROGRESSION? As previously discussed, many estate agents have complex staffing structures, one of the key areas you need to be clear on is that when you have a buyer who will then be dealing with your sales progression? The sales progression element of the estate agents work is critical, you can assess how good an agent is at this by using the ‘how many first time offers progress to completion?’ question, alongside asking who will be processing your sale. Some agents will send you to their head office to someone who doesn’t know you, your buyer or your home and they will be dealing with cases from many different branches and in many different locations. We believe sale progression should be carried out by the office who sold your home, they have the local needed to get you to completion. Who has the biggest window display and the largest number of properties. If the agent has lots of properties they haven’t sold, it takes them along time to sell them or their properties do not reflect the type of property you are looking to sell, you should think twice before adding them to your shortlist. Who has the biggest advert in the local paper. Very few people reach for the local paper when searching for a property to buy these days. Who has the most experience. In today’s rapidly changing market having 30 years’ experience does not mean as much as it used to do. The estate agency industry and the way in which houses are sold has changed rapidly over the last 5 years, if an agent hasn’t adapted it is unlikely that they can keep up to date with ever changing property buyer habits. Just having a Facebook, Twitter or Instagram account does not mean they have adapted and have the expertise to maximise the use of these channels, look out for other things such as what they use the social media platforms for, what they post and how their properties are advertised. As mentioned at the start. the two questions that most homeowners ask the agents are the two least important in our opinion. What is our house worth? The value of your home is not decided by the agent’s opinion, it is determined by the market of buyers, so you should choose an agent who you trust the most to deliver on their promises and who you think is going to maximise the value of your home AND THEN discuss the marketing price with them, based on everything that has been mentioned so far. The fee is (or should be) irrelevant. As long as you choose the correct estate agent for you, the fee should become less important. Many clients have told me that they although they trusted one agent over another and could see the difference in their marketing approach, they chose agent 2 because the fee was lower and they thought it would save them money. In the long run many of the clients who chose agent 2, in order to save in the short term, were forced to change agents, with some finally selling their property for significantly less than the original asking price – costing them additional time and money. Often an agent with a higher fee has the skill and approach to achieve and negotiate the best possible price for your home – meaning you could actually end up financially better off than choosing an agent with a ‘cheaper’ fee who may only achieve x amount of the asking price.